British Whites are one of the oldest breeds of cattle native the United Kingdom. Their survival as a pure breed wild cattle from ancient times has made them resilient, hardy and productive. They are considered a rare breed and are on the Rare Breed Trust critical list in Australia and on the watch list of the Rare Breeds Survival Trust in the UK. Naturally polled (no horns), large and gentle natured the British White has the uncommon characteristic of being both a beef and milking cow. A white coat on blue or dark pigmented skin and black points. A black muzzle, nose, ears, eyelids, teats of cows, legs with a splash of colour on the front of each fetlock, black hooves and a black tongue is desirable. Some cattle appear in the breed with red points, but still retain the foregoing markings. The body is usually marked with a splash of colour on the neck. 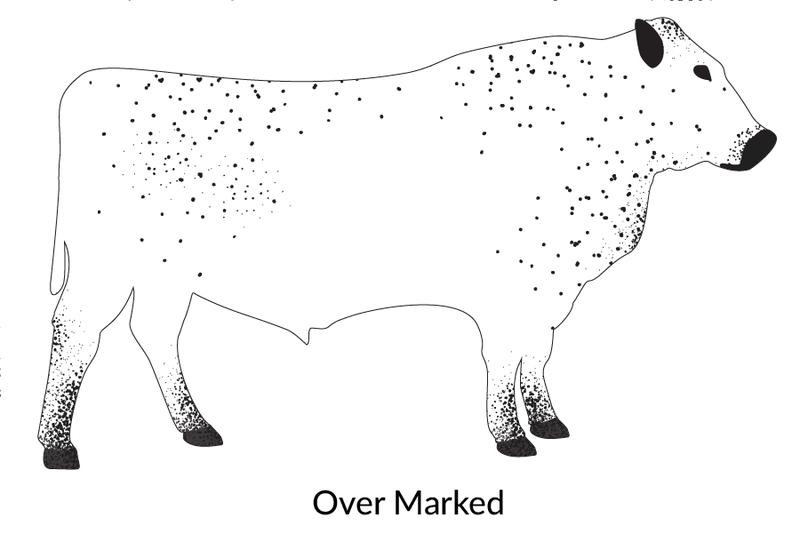 Some dollar spots may also appear on the body with breech marks on the back of the hind legs. The British White, a dual purpose pure breed, with its dark pigmented skin, dark points and strong black hooves is a breed able to naturally withstand all Australian conditions. These 9 characteristics are great reasons why you should consider the British White for your herd. 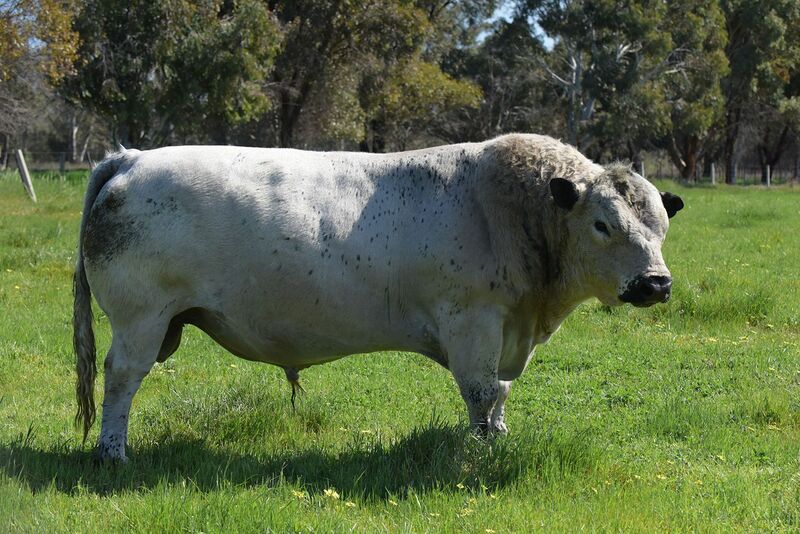 Fortunately, over the years, British White breeders refrained from chasing huge frame sizes and concentrated on the optimum for most Australian conditions. Generally females are Frame 5 (mature height over the hip of 135cm) and bulls Frame 6 (145cm). Stud breeders continue to concentrate on thickness with fertility, fat cover and milk in the females. The British White breed is docile with high intelligence, making them excellent to handle, which is important when running bulls in herds. A calf will grow and add weight based upon its mother’s ability to produce enough rich milk. 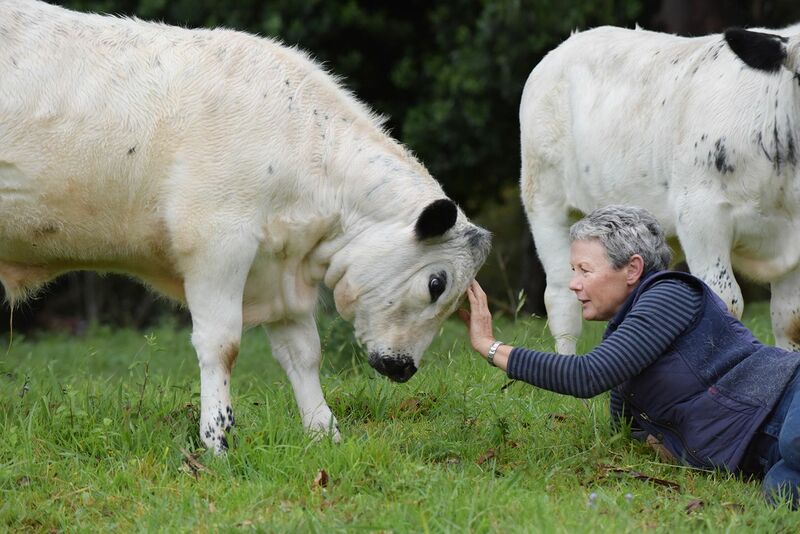 British White matrons are known for the abundance of rich milk available for their calves. British White cows are excellent mothers and even heifers with their first calf produce much rich milk. 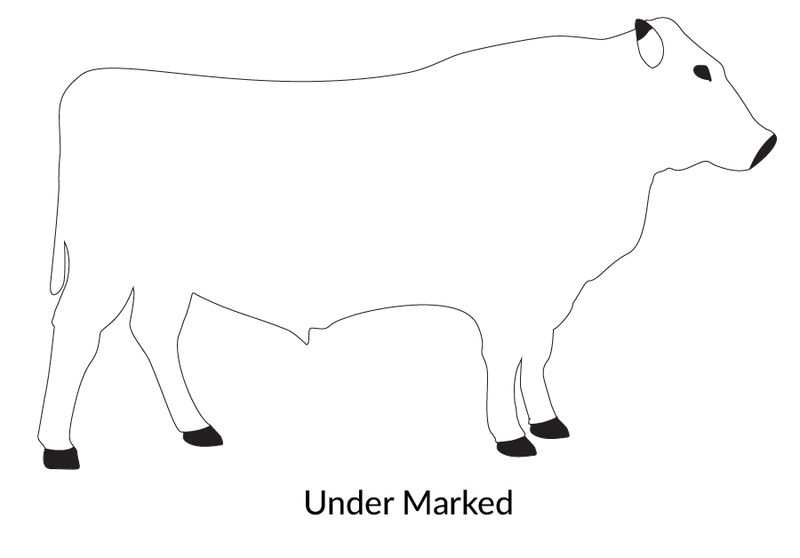 British White cows have well set udders with a minimum of fatty tissue and medium sized teats that hold their shape. It is not uncommon to see 14 and 15 year old cows with udders tightly set and well shaped teats! 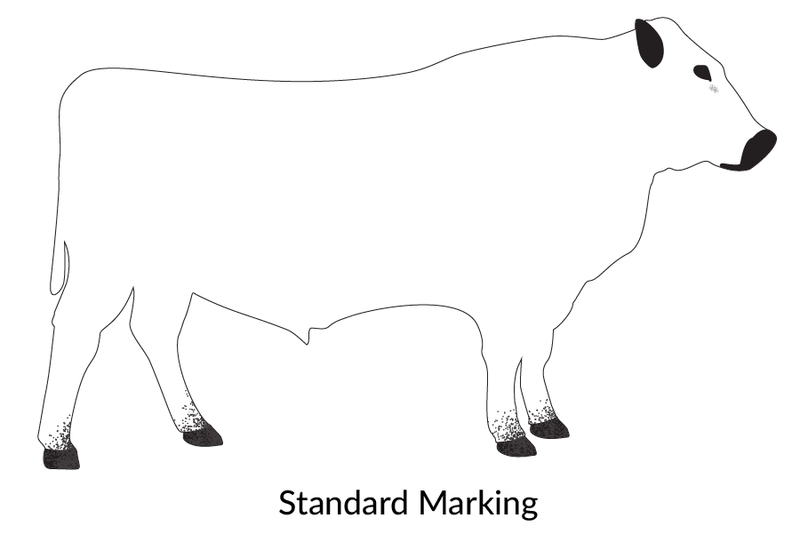 The British White, with it’s low input high efficiency traits, is able to convert grass into premium marbled beef of a consistently high grade without excess fat cover. While some breeds have made a name for themselves marketing their beef, we believe British White beef is as good as the very best, some say better. After surviving in the wild for thousands of years, British White cattle developed a hardiness that enables them to forage and graze under all kinds of adverse weather conditions. They thrive in either extreme cold or heat. 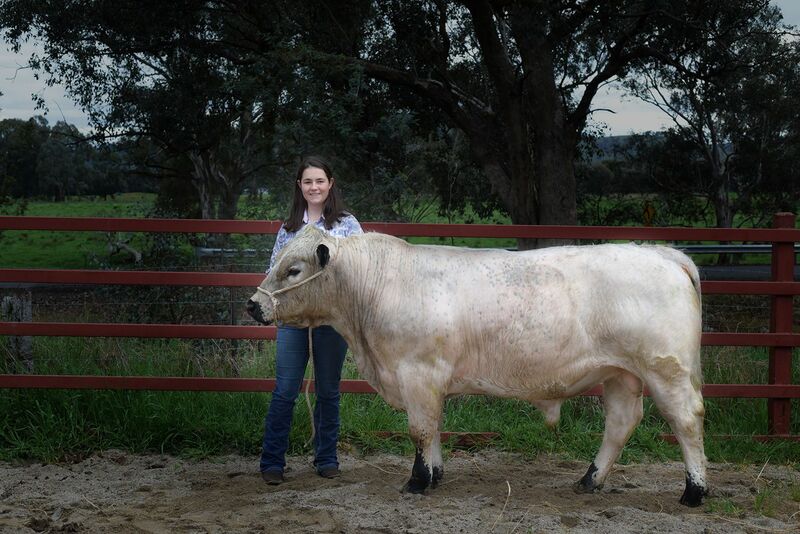 British White bulls are perfect for cross breeding. They transmit the superior qualities of the breed to all their offspring. Sometimes known as an ‘easy keeper’, the British White efficiently converts feed into kilograms of gain or maintenance. With their foraging nature, British Whites will make the most of what is available to eat in their environment. This means there is less reliance on feed, which is a positive trait, as we don’t want to finish cattle on anything other than grass. Being a relatively unchanged wild cow now domesticated, the British White genetic history is one of survival of the fittest and has given the breed a robust hardiness with little disease problems. They have a natural resistance to tuberculosis and viral pneumonia as an example. The black ears, eyes, nose, teats and dark pigmented skin reduce the threat of cancers and sun or snow burn, while the strong black hooves deter most feet problems. Their docile nature, intelligence and natural ability to finish on grass helps reduce time spent on maintaining the herd. Perhaps because of the British White breed history or the breeds hardiness, British White cattle tend to lead productive lives for longer. It is not unusual to have a sound breeding matron of 12 plus years. British White bulls provide that rare quality of throwing a medium to small calf that grows well. first cross calf properly marked. The British White is a naturally polled, large and hardy native breed exhibiting the dual characteristics of beef and milking ability. Must be white with black or red points, viz. Nose, muzzle, pigment round the eyes, ears, teats of cows or rudimentary teats of bulls, hooves and splash or spots of colour on the front of each fetlock. The skin showing dark pigmentation. Free from slugs or rudimentary horns. It should be of a fair length from eyes to muzzle, which should be broad. The heads of bulls should be masculine in character and of cows, fine and feminine. Animals should be functional and free moving on sound feet, with a long level top line, not rising at the root of the tail, broad and expanding over loins to hips, pin bones well apart especially in the bulls. The shoulders gently sloping and well set in, the ribs well sprung. The underline should be level. The hindquarters long from hook to pin, buttocks being well fie shed down to the hocks, which when viewed from the back, should be straight, turning neither inwards or outwards . is important that the rudimentary teats of bulls should be wide set and developed. Should be fine and handle well.